Toledo is everything that American kids thought that visiting Europe would be, back in elementary school when we first discovered the history of the Middle Ages and Renaissance. With a giant castle dating back to the 16th century, defensive walls with turrets, and the Tagus River flowing by and looking remarkably like a moat if you set the picture up right, it’s an absolutely gorgeous sight. Inside the walls, the eye candy continues: twisting pathways, cobblestone streets (most of which are pedestrian-only), giant houses of worship that seem to be around every corner, and, of course, swords of varying levels of price being sold in shop windows on almost every street. 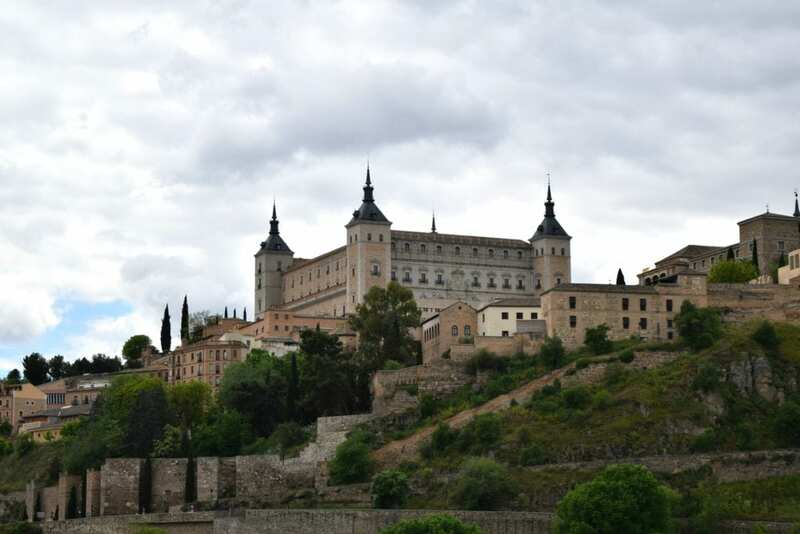 Pictures, of course, are initially what inspired us to make a Toledo day trip from Madrid, but the views were certainly not the only reason to go. The history of Toledo dates back almost 2000 years on record and likely goes beyond that–and the history is remarkable. Toledo was run by the Moors (Muslims) for roughly 300 years in the 8th-11th centuries, later became independent, and eventually became a piece of modern Spain. It is famous for its historical tolerance between Muslims, Jews and Christians, though “tolerance” is a wildly generous to downright false word by the modern definition, depending on which century we’re discussing. There are two main public transportation options for getting to Toledo from Madrid: the bus and the bullet train. The bullet train takes 33 minutes, and is 12,50 Euros per person, each way. The bus is estimated to take 1 hour (traffic dependent), and is 9,75 per person, round-trip (if you buy a round-trip ticket–this allows you a small discount on the way back). We opted for the bus and were perfectly satisfied–we rode at off-peak times and it only took 45 minutes each way. Well worth the cheaper price, in my opinion. As a bonus, the bus station drops you closer into the city than the train station does, so if you’re planning to walk in, the bus is an advantage. Once in Toledo, we took a ride on the city’s hop on/hop off tour to hit some of the main viewing points of the city. 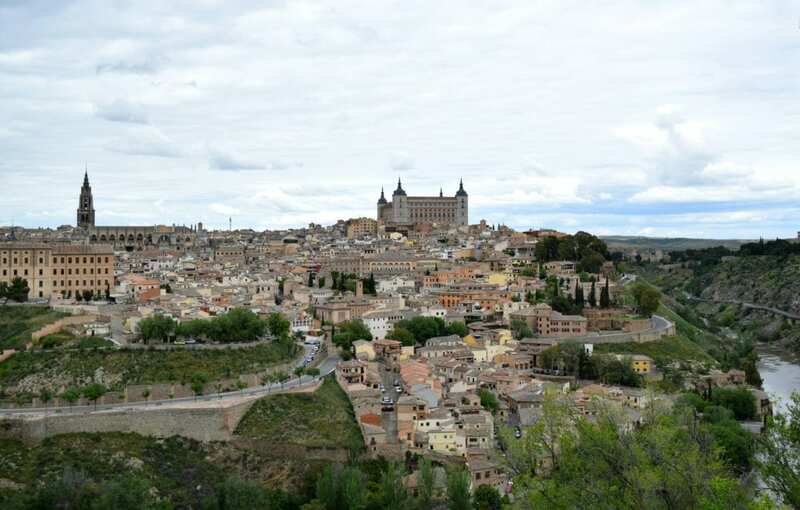 The biggest benefit to the tour was to ride back outside the city walls to some incredible viewpoints of Toledo that would not have been available to us on foot. The narration on the tour was decent, and even though we don’t normally go for the hop/hop off style tours, I’m glad we took this one for the views alone. The price was 9,00 Euros each for an all-day pass. I wouldn’t have minded having access to a rental car on our Toledo day trip: it would enable us to come and go as we please, reach some of the outer viewpoints more easily, and though you can’t take the car through much of the old town, we passed several parking choices. If we come again, this may be an option that we consider, depending on budget. Admire it. Seriously, just admire it from every angle. Take pictures. Stare. Take more pictures. Stare again. Revel in the fact that you are walking among buildings and walls and bridges that date, for the most part, between the 11th and 16th centuries. If you have a child with you, they may or may not insist on buying a sword. Let them (have a safe one). After all, when is the next time you’ll be touring a place renowned for its steel for more than 2000 years? As Spain is stop one of a 6-month trip for us, we’re trying to be very aware of the possibility of getting “out-churched” (and in Asia, “out-templed”). Because of this, we didn’t choose to tour the many, many houses of worship. 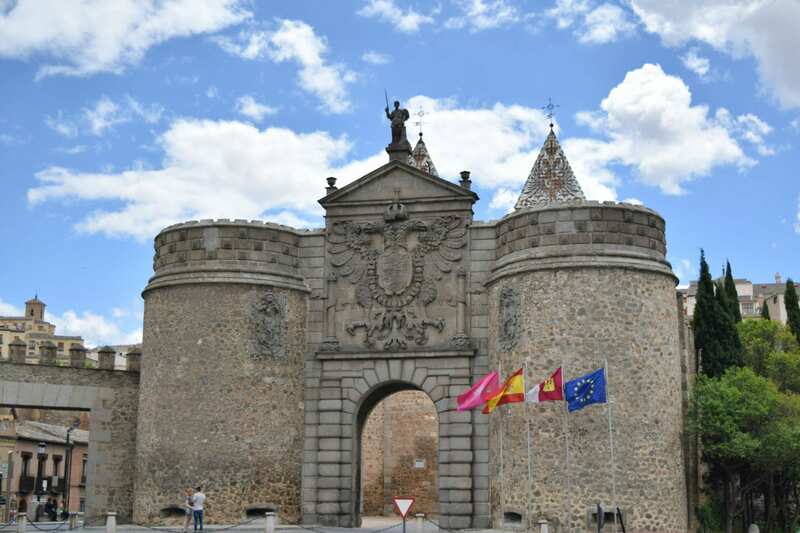 For a few Euros each, there are plenty of options: of the 28 historical attractions of Toledo listed on the tourist map we picked up, 15 of them are either churches, mosques, synagogues, convents or monasteries. We did, somewhat by accident, stumble into a small chapel on the side of the Toledo Cathedral. Built beginning in 1226, the interior and exterior of this cathedral are stunning. The chapel we entered was open to the rest of the floor, but cut off by a small fence so we couldn’t continue forward. It was enough to get the idea, though: grand doesn’t even begin to cover it. After that glimpse, we didn’t feel the need to pay for a more complete tour–or, to be frank, find the right place in the twisting, tiny streets to pay for it and enter. 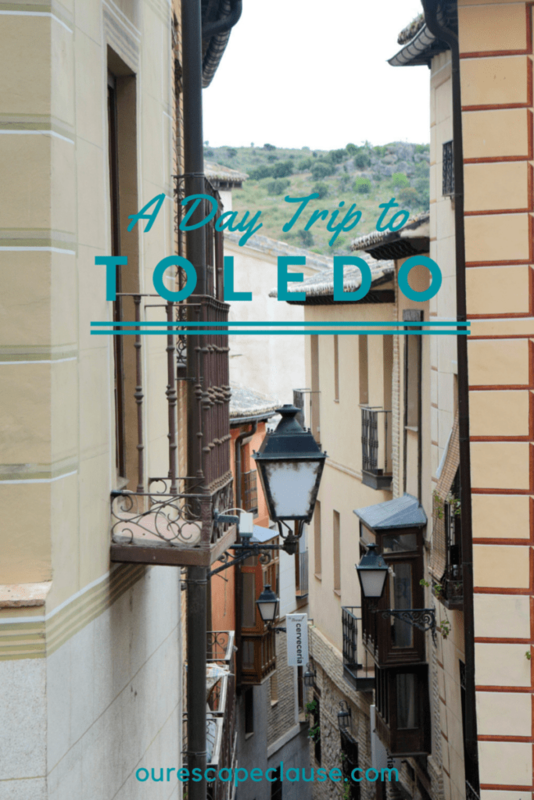 The most fun we had during our one day in Toledo was simply getting lost. It is so easy to get turned around there, and we found ourselves ducking in and out of alleys, often feeling completely absorbed into the city before suddenly looking up and finding that we had come to the city’s walls or maybe an overlook with a gorgeous view of the countryside again. Don’t spend one day in Toledo without travel insurance! We use and recommend World Nomads for their affordability, ease of purchasing & the clarity of their contract! 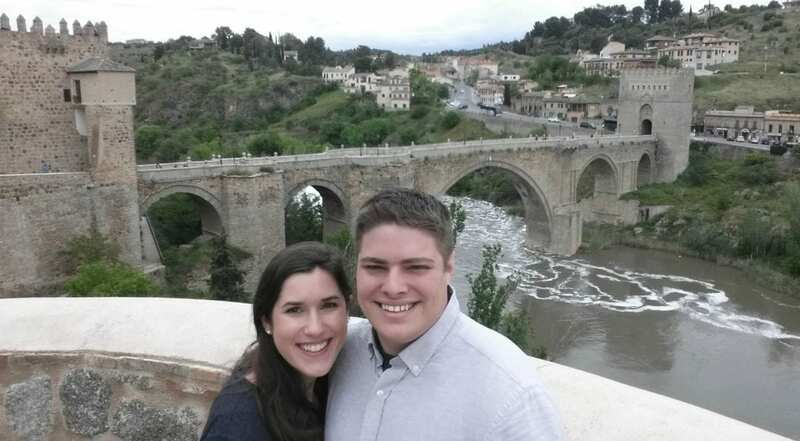 Some links in this post about spending one day in Toledo are affiliate links. If you click through one of these links, we may earn a small commission at no extra cost to you. We are committed to only ever recommending products and services that we personally use and like.